See what our families have to say about our classes!!! Read about the DeVinney family's 9-year experience with Music Together®! "I heard over the baby monitor Savannah singing "Hello Everybody" to her stuffed animals. Hello to the monkey, hello blue puppy, we're so glad to see you...etc...it was pretty cute. Later, she was in there doing the ba ba ba chant. So, she is getting something out of the class, even though she doesn't really participate until the lullaby when she jumps in your (the teacher's) lap!" 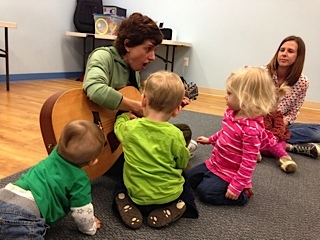 "Thank you so much for a wonderful enriching musical experience for my children!" "A week or two ago I filled out a questionnaire about my granddaughter's learning experience in Music Together Sing and Groove...We play the music CD each day and this past week she began singing to one of the songs. Then she picked out two toys which shake and make noise, handed me one and we began to shake the toys to the music. Then she started some arm action like we do in class...and she started turning around in tight little circles. I couldn't believe it. She has been absorbing!!!!" "We are listening to and learning this semester's songs, though Caroline loves to listen to previous MT semester CDs too. Just this morning, she got out her Maracas songbook looking for the song, "Hop 'Ol Squirrel." She found the picture/music, then asked me to sing it! The older she gets and the more she is able to communicate her thoughts and ideas, I realize how much more she got out of the Music Together® classes -- a year ago -- than I was able to recognize at the time!" "Suddenly Emma is "singing" whole songs without any prompting from me. She was in the car seat and I unexpectedly heard "Issy bissy spy-dah" (Itsy Bitsy Spider) all the way through, complete with hand motions, though in a rather special language intelligible only perhaps to me!...It's wonderful to watch." "Music Together is a great opportunity to show our child why we love to make music. The class is structured, yet not too formal. We love the mixed ages environment because she can watch older children and try to follow what they do. the CD's and songbooks make it easy to use at home. We were looking for a program for a baby and this was something she could do before she was even able to walk. Now that she's a little older, it is still perfect!" "I wanted to thank you for all the effort you put into the class. It is Wade's favorite activity, and I am so glad we can be a part of it!" "I just want you to know how much our family LOVES Music Together and Ms. Anne! My son is two years old and the youngest of 4. We play the Music Together CD in the car all the time and all the older children sing along. My favorite is when they sing w/o music and Tommy (2) joins in!" "Visualize this. Mia was at the playground next to the ocean and of course did not want to leave. As we started to slowly walk up the stairs to the boardwalk and head back to the house, we started singing the song, "See the Pony Galloping." Well, that was a big hit. In fact, Mia and Daddy galloped and slowed down, then woke up the tired pony with a scream for over 8 blocks! We must have been a spectacle because we generated smiles and laughs to others along the way."